Energy geostructures are a tremendous innovation in the field of foundation engineering and are spreading rapidly throughout the world. They allow the procurement of a renewable and clean source of energy which can be used for heating and cooling buildings. This technology couples the structural role of geostructures with the energy supply, using the principle of shallow geothermal energy. 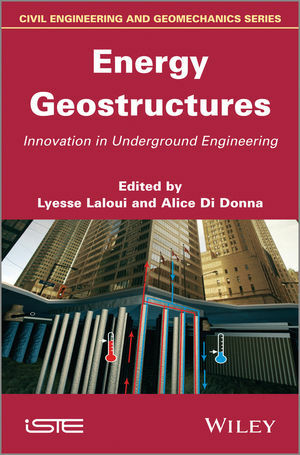 This book provides a sound basis in the challenging area of energy geostructures. The objective of this book is to supply the reader with an exhaustive overview on the most up-to-date and available knowledge of these structures. It details the procedures that are currently being applied in the regions where geostructures are being implemented. The book is divided into three parts, each of which is divided into chapters, and is written by the brightest engineers and researchers in the field. After an introduction to the technology as well as to the main effects induced by temperature variation on the geostructures, Part 1 is devoted to the physical modeling of energy geostructures, including in situ investigations, centrifuge testing and small-scale experiments. The second part includes numerical simulation results of energy piles, tunnels and bridge foundations, while also considering the implementation of such structures in different climatic areas. The final part concerns practical engineering aspects, from the delivery of energy geostructures through the development of design tools for their geotechnical dimensioning. The book concludes with a real case study. 1. Soil Response under Thermomechanical Conditions Imposed by Energy Geostructures, Alice Di Donna and Lyesse Laloui. 2. Full-scale In Situ Testing of Energy Piles, Thomas Mimouni and Lyesse Laloui. 3. Observed Response of Energy Geostructures, Peter Bourne-Webb. 4. Behavior of Heat-Exchanger Piles from Physical Modeling, Anh Minh Tang, Jean-Michel Pereira, Ghazi Hassen and Neda Yavari. 5. Centrifuge Modeling of Energy Foundations, John S. McCartney. 6. Alternative Uses of Heat-Exchanger Geostructures, Fabrice Dupray, Thomas Mimouni and Lyesse Laloui. 7. Numerical Analysis of the Bearing Capacity of Thermoactive Piles Under Cyclic Axial Loading, Maria E. Suryatriyastuti, Hussein Mroueh , Sébastien Burlon and Julien Habert. 8. Energy Geostructures in Unsaturated Soils, John S. McCartney, Charles J.R. Coccia , Nahed Alsherif and Melissa A. Stewart. 9. Energy Geostructures in Cooling-Dominated Climates, Ghassan Anis Akrouch, Marcelo Sanchez and Jean-Louis Briaud. 10. Impact of Transient Heat Diffusion of a Thermoactive Pile on the Surrounding Soil, Maria E. Suryatriyastuti, Hussein Mroueh and Sébastien Burlon. 11. Ground-Source Bridge Deck De-icing Systems Using Energy Foundations, C. Guney Olgun and G. Allen Bowers. Jean-Baptiste Bernard, Wolf Friedemann, Nico Von Der Hude, Norbert Pralle, Veli Matti Uotinen and Bernhard Widerin. 13. Thermo-Pile: A Numerical Tool for the Design of Energy Piles, Thomas Mimouni and Lyesse Laloui. 14. A Case Study: The Dock Midfield of Zurich Airport, Daniel Pahud. Lyesse Laloui is Chair Professor, Head of the Soil Mechanics, Geoengineering and CO2 storage Laboratory and Director of Civil Engineering at the Swiss Federal Institute of Technology (EPFL) in Lausanne, Switzerland. Alice Di Donna is a researcher at the Laboratory of Soil Mechanics at the Swiss Federal Institute of Technology (EPFL) in Lausanne, Switzerland. Lyesse Laloui, Chair Professor and Head Soil mechanics, Geoengineering and CO2 storage Laboratory; Director of the Civil Engineering; Swiss Federal Institute of Technology, EPFL, Lausanne, Switzerland. Alice Di Donna, Researcher at the Laboratory of Soil Mechanics; Swiss Federal Institute of Technology, EPFL, Lausanne, Switzerland.